In the run-up to release of the Post-2015 development framework, the Sustainable Development Goals, one concept has come up several times: the differential responsibilities of developed and developing countries. According to the Open Working Group tasked with drafting the proposed Goals and associated indicators, “Each country has primary responsibility for its own economic and social development and the role of national policies, domestic resources and development strategies cannot be overemphasized. Developing countries need additional resources for sustainable development” (emphasis mine). Thus, “developed countries” will be financing the sustainable development of “developing countries.” Which is correct and proper. But how to distinguish between a developed country and a developing country? Ask any development professional to name all of the developing countries and he or she will produce a list that mostly agrees with any other development professional’s list. I would assume that we can agree as a community on about 75 – 80% of the countries that would qualify as “developing.” It’s on the margins between “developing” and “developed” that we might disagree. For example, there are more poor people in India than anywhere else in the world, but India’s economy is one of the largest in the world. Is India developed or developing? Are Kenya and Nigeria with two of the three largest economies in Sub-Saharan Africa developed countries, like South Africa, or developing countries like their immediate neighbors? These are the debates that will consume much of the negotiations as countries try to position themselves to benefit from the resources that are made available to achieve the Sustainable Development Goals. There will be many good and reasonable arguments on both sides as the status of these and other countries are decided. However, we will not have a long time for these debates as the final Goals will be approved in less than a year. Therefore, I propose a simple test to determine whether or not a country should be classified as “developed” or “developing”: Does the country sustain a Maserati or Ferrari dealership? This question came to me when I was working in El Salvador and learned that a new Maserati dealership was opening in San Salvador. At first I was dismayed at the thought that Maserati would even consider opening a dealership in a country which had only recently suffered civil war and natural disasters, but then I figured that the bigwigs back in Italy had done their homework and knew that the conditions in El Salvador were ripe for sales. As such, we in the development community can use the presence of Italian super car dealerships, specifically Maserati, Ferrari or Lamborghini, as a marker for certain preconditions in a country, but we’ll keep the name “Maserati Theory of Development” because Maserati was the inspiration. This would not be the first luxury car dealership to open in a country. That would be Mercedes. On November 3 the United Nations Development Program (UNDP) released the 2011 Human Development Report and the Human Development Index (HDI) ranking countries by their level of development. With a scoring system of 1.0 being highest and 0.0 being lowest, Norway is again the most-developed state according to the UNDP with a score of 0.943 and the Democratic Republic of Congo (DRC) is the least developed at 0.286. According to the report, mine-affected African states make up the five least-developed states: Chad, Mozambique, Burundi, Niger and the DRC (Somalia, also very much mine-affected, could not be rated using UNDP’s methodology, but almost certainly would have been among these countries). Overall, mine-affected countries had an average HDI score of 0.602 whilst non-mine-affected countries had an average score of 0.694. The difference between mine-affected and non-mine-affected countries compares to the difference between Turkey (HDI = 0.699 a member of NATO and a candidate for entry into the European Union) and Tajikistan (HDI = 0.607, and a major conduit for opium from Afghanistan). Regressions show a negative correlation (Pearson’s r = -0.255) between the presence of landmines in a country and HDI score. One of the key elements of the Mine Ban Treaty is the principle of international cooperation, described and codified under Article 6. The article requires “State Parties in a position to do so” to provide assistance to mine-affected states, assistance that includes demining, technical knowledge and victim assistance. In this spirit of cooperation, Croatia’s president, Ivo Josipović, declared “Croatia also has vast experience in humanitarian demining and is ready to assist others with its knowledge and expertise,” at the United Nations General Assembly meetings in September (Reaching Critical Will). If Croatia, ranked 46th on the HDI can offer assistance to other mine-affected countries, how much assistance have the five most-developed countries provided to the five least developed? The five most-developed nations, according to the 2011 Human Development Report are (in order) Norway, Australia, Netherlands, United States and New Zealand. The United States is not a party to the Mine Ban Treaty, but has been the greatest contributor to mine action over the years and seems to follow the spirit of the Treaty’s international cooperation clause. 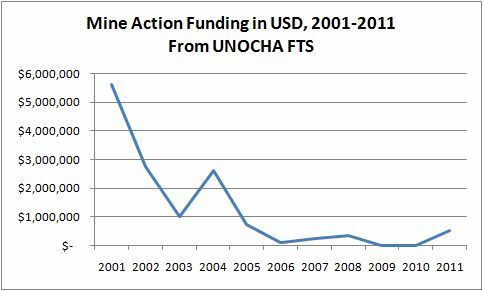 Using data from the United Nations Financial Tracking Service (FTS), we can review all of the 2010 mine action contributions (in US dollars) from the five most-developed countries to the five least-developed; as well as the 2010 mine action contributions in general to see if those in a position to provide assistance are actually doing so. 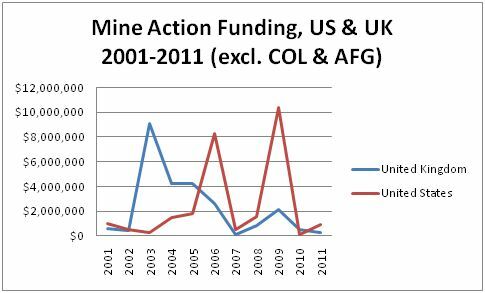 2010 mine action contributions from the five most-developed to the five least-developed states totaled $9.4 million and came from two countries, Norway and the Netherlands. Norway sent $1.4 million to the DRC and $600,000 to Mozambique. The Netherlands sent $7.4 million to the Democratic Republic of Congo. The other top five countries (Australia, New Zealand and the United States) did not contribute any funds to the bottom five. In fact, according to FTS, Burundi and Niger received no mine action funding in 2010 from any countries; Chad received $254,000 from the International Committee of the Red Cross, the ultimate origin of which is unknown. More broadly, the five most-developed states gave $77 million in mine action funding globally with Norway (the most-developed nation) giving nearly half that sum, US $35 million. 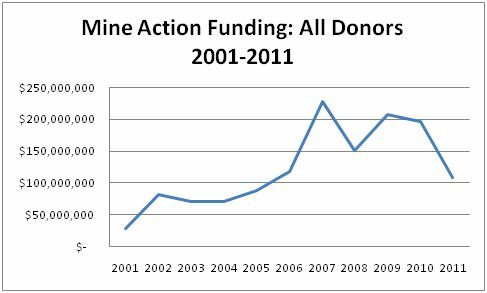 The top five contributors in terms of total funding for mine action in 2010 were Norway ($35 million), the United States ($29 million), Japan ($23.4 million), Germany ($23.2 million) and Canada ($17 million) for a total of $127 million. With the exception of Norway, these states are some of the largest economies of the world, all members of the G20 group of nations and so they should be able to contribute more than others. 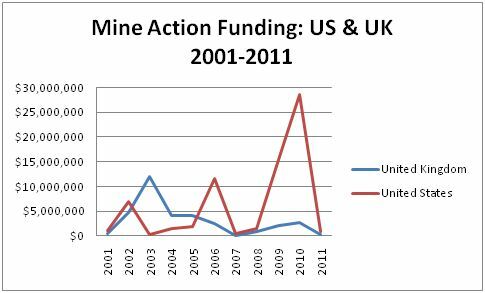 A better test of the importance of mine action funding to a country (and therefore its commitment to the international cooperation spirit of the Mine Ban Treaty) would be to look at the mine action funding per capita. In fact, Norway contributes nearly five times more per capita for mine action ($7.18 per person), than the next highest state, Denmark ($1.51). A third Scandinavian state, Finland, is the only other country that gives more than $1.00 per person in mine action funding. The Netherlands ($0.61) and Luxembourg ($0.59) round out the top five states in terms of per capita funding. Australia and United States give $0.15 and $0.09 per capita to mine action, respectively. If the United States were to contribute to mine action funding at the per capita rate of Norway, the total contribution would be over $2.2 billion. Considering that at least one estimate of the total cost to clear all landmines globally is $33 billion (United Nations), a United States that contributes at the same level of commitment as Norway could shorten the total amount of time required from 1,100 years to 15. So, the data shows that Norway, the country in the greatest position to provide assistance to mine-affected states, at least according to the Human Development Report, does so both in total and per capita. A special note here: New Zealand’s mine action contributions were not reported via the Financial Tracking Service. According to the Landmine Monitor, in 2010 New Zealand contributed $3.3 million to mine action which represents a per capita giving level of $0.77, greater than the Netherlands so the FTS numbers need to be kept in their context (as do the Human Development Report numbers which exclude Somalia). In Eritrea, there are an estimated 1.5 million landmines and more than 5,000 survivors of landmine injuries. Nearly an eighth of the population (655,000 individuals out of 5.2 million in 2010) lives in a community affected by landmines. For comparison purposes, one-in-eight Americans live in California so imagine if all of California was to be mine-affected. Eritrea is, by any measure, one of the most mine-affected countries in the world and earlier this year, Eritrea submitted a request for an extension of its Article 5 mine clearance deadline under the Mine Ban Treaty. Eritrea’s Article 5 Extension request, to be considered for approval by the Eleventh Meeting of States Parties to the Mine Ban Treaty (11MSP) in Phnom Penh, Cambodia in November of this year, is a bit unusual. Instead of asking for an extension of time to complete demining activities, Eritrea requests a three-year extension (until February 2015) to determine the full extent of landmine contamination in the country. In 2004, the Survey Action Center completed a Landmine Impact Survey of Eritrea that provides the baseline for all mine action in Eritrea, but the authors of the extension request believe that the information from the LIS needs to be refined and improved. Eritrea’s extension request is essentially a request for time to re-assess the LIS findings; eliminate suspected hazardous areas through non-technical survey and land release; and survey areas that had not been covered by the LIS due to dangerous conditions at the time of the LIS. If this extension request is approved, then Eritrea will submit a second extension request in 2014 with a detailed plan for demining all remaining mine-affected areas. As Eritrea’s extension request is reviewed by the 11MSP, I think the reviewers must consider the following points. First, an approval of this request implies a tacit approval of the second request that will be submitted in 2014. Second, that other countries with pending mine clearance deadlines might mimic Eritrea’s request, submitting extension requests without detailed implementation plans. Both of these are important issues, but not nearly as important as the third: Eritrea will need help from the international community to meet its mine clearance obligations and that assistance may be difficult to obtain. Eritrea has come to be seen as a pariah state, a long cry from Bill Clinton’s laudatory claims of its place as part of the “new breed” of African states and leadership. Recent stories have focused on Eritrea’s plans to bomb the African Union meetings in Addis Ababa in January 2011, its support for the Al Shabaab rebels in Somalia and its expulsion of non-governmental organizations (full disclosure: my former employer, Landmine Survivors Network, was also forced to terminate operations in Eritrea in the early 2000s). In the last couple of weeks however, Eritrea has sought to mend fences and the president, Isaias Afewerki traveled to Kampala to meet with Ugandan president, Yoweri Museveni, to build goodwill in advance of Eritrea’s efforts to re-join the East African political alliance, the Intergovernmental Authority on Drought (IGAD). The thaw in Eritrea’s relations with its neighbors comes in the wake of new sanctions against Eritrea for use of child soldiers, in the face of East Africa’s crippling famine and just as Eritrea is seeking international support for mine action. I think it is highly likely that Eritrea is starving and needs the assistance of the international community to survive. Eritrea will also need significant assistance to meet its mine clearance obligations and that need should be considered as Eritrea’s Article 5 extension request is reviewed. Since the mid-2000s, when it expelled the last of the humanitarian and development NGOs working in the country, Eritrea has received less and less foreign aid. According to the World Bank, aid to Eritrea has stagnated at around US $150 million per year since 2006, levels last seen during Eritrea’s 1998-2000 war with Ethiopia. In addition to the decline in overall foreign aid to Eritrea, international assistance for mine action has collapsed almost entirely. When Eritrea acceded to the Mine Ban Treaty in 2001, significant assistance was made available to Eritrea for mine action. That assistance has declined dramatically as seen in the chart below from data provided by United Nations’ Financial Tracking Service. Eritrea complains in its Article 5 extension request that the actions and funding provided to international mine action NGOs in the early 2000s were unknown and the inability of the Eritrean government to control those organizations – and perhaps more importantly, control their funding – led to their expulsion. Eritrea proposes to have all of the demining be done by its own mine action authority and pledges to contribute almost $5 million to cover the demining and mine-risk education between 2011 and 2015. An additional $3.5 million is sought from other sources to fully fund the mine action plan. With recent international support for mine action in Eritrea negligible, the 11MSP reviewers of Eritrea’s extension request will need to consider whether or not the $3.5 million is forthcoming. More importantly, Eritrea will need tens of millions of dollars to conduct demining once the scope of contamination is known (with 1.5 million mines and a cost of $100 to clear each mine, Eritrea may need as much as $150 million to completely demine the country). The 11MSP reviewers cannot guarantee mine action funding for Eritrea, but the reviewers will need to provide more than just platitudes about the need for the international community to support Eritrea’s mine action efforts. The reviewers should take the temperature of the donor countries to determine the donors’ ability and willingness to commit the long-term funding needed for demining in Eritrea. 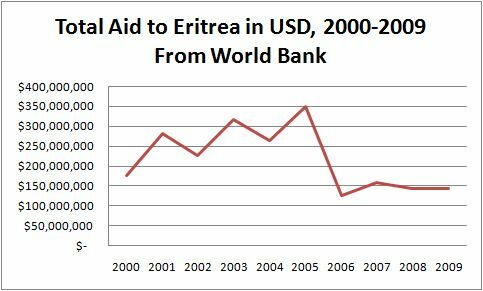 In addition, the reviewers should question Eritrea’s ability to match international contributions. According to the LC3 Dataset from the World Bank (when Iraq and Afghanistan are excluded), donor countries provide 60% of the funding for mine action and affected countries provide the remaining 40%. Can Eritrea pledge to commit this level of funding in its second extension request? If not, will donors be willing to make up the difference? One area that will help the reviewers in their decision-making will be to observe the current relations of Eritrea with its neighbors and monitor donor pledges to Eritrea. If Eritrea re-joins IGAD, that would represent a significant thaw in its relations with other East African states; if UN sanctions against Eritrea are lifted (or lessened), that would suggest that international aid to the country may increase; if Eritrea accepts the assistance of international NGOs, that would increase the capacity of the country to engage in mine action. Equally important to monitor would be the famine assistance Eritrea receives. According to the World Food Programme, more than 35% of Eritrea’s population is undernourished, but WFP does not work in Eritrea and the full impact of the East African famine on Eritrea is unknown. If Eritrea asks for and accepts WFP assistance, that might be the most telling indicator for the 11MSP reviewers; it might be the only good thing to come out of the famine in the Horn of Africa.